" Bassets are always on the move to free their yards from squirrel, mole, bird and rabbit terrorists. 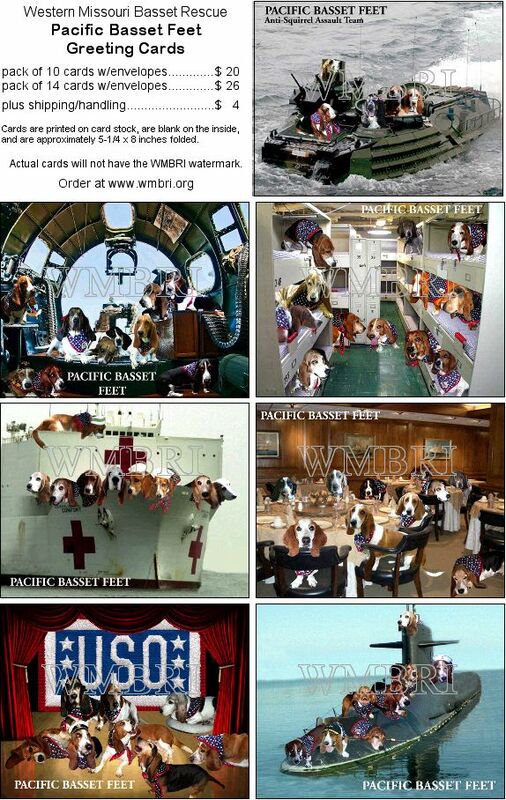 Get these Greeting cards showing Bassets in action against varmint invasions." Details are at the left. Orders may be placed using a credit card on the WMBRI web site using PayPal. Scroll down to toward the bottom of the page to reach the PayPal button and click once. At the top of the page, type "PBF Cards" in the description box and the correct dollar amount for the number of card packs plus shipping being ordered in the next box. In the "Comments" box, type in the type (10 or 14) and number of each pack being ordered.